Pandora has suddenly left us to be a star on Planet Guinea; she is the dark star with shiny patches of gold that lingers in the background, but does occasionaly and unexpectedly move out to the foreground. Pandora came to Planet Guinea as part of the Satin Study, we had plenty of purebred Satins donated by breeders but no pet Satins to compare and contrast with. Some very thoughtful Humans brought Hope and Pandora from their local pet shop and donated them so we could monitor them for signs of Osteodystrophy (OD) throughout their lives. Pandora was not only the heaviest Satin on Planet Guinea she was the heaviest resident! For a while Pandora was a little unsure of her position in her group and viewed newcomers as a threat, but as time went on she became as accepting as her friends, she was part of the group that helped Goldie and Little Miss Lucky overcome their problems. Karen (Counting the shiny stars on Planet Guinea). Gucci the Gorgeous Golden Guinea was one of the few guineas not adopted from RGPR. 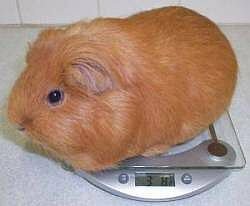 At the time, Scruffy was looking for a husband, but Karen only had mini-pigs and you have to be at least 2 years old to have any hope of being a Gorgeous Guinea. So, it was off to another local rescue with Scruffy in tow. There were lots of guineas to choose from but “Fluffy” a lovely big golden boar caught my eye and it was love at first sight. How anyone could have parted with him is beyond me, but they had. Said rescue didn’t “do” speed-dating, so Scruffy could only have a little nose-to-nose sniff of Gucci rather than being able to take his time to get to know each other on neutral territory. A homecheck was arranged and in the meantime Gucci had his “little op”. I did offer to have him castrated by my own guinea-competent Vet, but they used another surgery, and as a result, Gucci ended up with a large post-castrate abscess which appeared soon after he arrived here. I visited him a couple of times during the two week period after his op and then collected him to bring him home. Introductions were done on neutral territory and Scruffy wasn’t exactly friendly. She went for him and Gucci just sat there and was very patient with her. After a lot of patience and 3 weeks of spending short periods of time together, Scruffy decided to give up her aggressive stance and was happy to live with Gucci. They made a nice pair – both lively and full of fun. When Gucci was first put out on the grass, he just sat there for about 20 minutes, not knowing what to do. It would appear that he hadn’t seen grass before, but soon made up for lost time. At the age of 3, Gucci’s right eye swelled up overnight and the conjunctiva was very red, angry and protruding out of his eye. A trip to the emergency Vet followed, and he was given pain relief, antibiotics and eye drops to get him through the day (it was a Sunday). On the Monday we went to see James the Vet who diagnosed an abscess behind the eye. Despite having had eye drops every couple of hours to keep the eye moist, the decision was made to remove the eye as it would be hard to save. James was a very experienced surgeon but even he had only ever done about 10 guinea pig eye removals. Gucci was operated on the following day and sailed through the experience. James removed 4ml of pus from behind the eye (that’s a LOT of pus! ), stitched up the eye and sent him home with antibiotics and pain relief. After 2 days we returned for the first post-op check and there was still quite a lot of pus in evidence. I was offered stronger antibiotics to help kill off the infection, but they could also cause major problems with the digestive tract. These were declined and instead, I started flushing his eye socket with Colloidal Silver and giving him a couple of homeopathic remedies. This was duly noted on Gucci’s medical notes – I don’t think James was used to having his suggestions declined. The following week we returned for the 10 day post-op check and there was no sign of any pus and the eye had healed up perfectly. James admitted that he was surprised that all the pus had gone, but was impressed with what I had achieved! When Scruffy died unexpectedly after a short illness, Gucci was very miserable and clearly needed a new friend. So, it was off to see Auntie Karen for a spot of speed-dating. He had a choice of 4 lovely sows but it soon became clear that Allegra was to be his next wife. She was a stunning black and white guinea and Gucci soon perked up again. He loved Allegra to bits and they were so happy together. Sadly it was only short lived and after about a year, she wasn’t well one morning. Despite an emergency appointment at the Vet an hour later, she died the same afternoon – in the run, in the warm sun, out on the grass which was her favourite place. Again, Gucci was on his own and after a few days he met the lovely Pascha and they got on very well. She was a very small guinea, so it was like looking at “Little and Large” when they were together. Again, he was a very kind and caring towards her. Gucci never had any further Vet visits after his eye op until he had a short illness just before he died. He was at least 6 and had a very happy life here at Piggy Paradise. My abiding memories of Gucci will always be his large size, gorgeous coloured hair, how much he loved each of his wives, not to mention singing and pooping his way through every bath as well as being smart enough to put his head back to to have his face rinsed. He was simply a one-off larger than life guinea. (Karen) Although Gucci wasn’t from RGPR he came here to choose his new wives who were very happy with him. Harmony (Allegra) was an unwanted pet like many of the guineas we get here; Penny (Pascha), was brought to me when her 8 year old human had got fed up with her and her sister and would no longer care for them. A few days later I had a call saying that “the bribe had worked and it was now understood that they must be looked after or back to the rescue they go”, I don’t do bribes here, but as the guineas had been signed over into my care the humans needed to undergo a homevisit etc in order to get their guineas back. They were very reluctant to do this and eventually Penny and Tuppence were found new homes.